We have had our yubo since the fall and I love packing lunch in it so I wanted to share with you why I like it and give you a chance to win one for yourself! Today's lunch includes strawberries, blueberries, vanilla yogurt and a snowman sandwich decorated with mini chocolate chips, a tiny carrot and a winter hat cupcake topper. I added popcorn snow and cheese snowflakes for a snowy lunch! But back to the yubo! I bought our yubo last fall on a whim after seeing it online and liking the "old school" lunch box style. I had originally bought the yubo for my first grader because I did not think the older kids would like it. Was I wrong! We currently have a calendar on the fridge showing the days when everyone gets a yubo turn! Even though the yubo was recommended online for kids 3-6 I have to say that my kids are between 3-10 and they all LOVE this yubo. I will have to get more! I love the lunch box look, the fact that you can change out the face plates (which comes in handy when several kids share the yubo or you want to make sure you can change the look once your child gets older) and the durability of the yubo. My kids are rough on everything and the yubo still looks like new! It is a little bigger then a regular lunchbox but my kids either carry it or it fits comfortably in their backpacks and lockers! I love that it comes with these unique containers: two rounds and one sandwich box and that they are easy to open and close (even my 3 year old can handle it). Also since the whole lunch box comes apart and is plastic even if a container was not tightly closed clean up would be easy. The deluxe yubo lunch box also comes with an ice pack and there are several things I like about it: 1) Most lunch boxes don't come with a fitting ice pack which makes it often difficult to find ice packs that fit. 2) The yubo ice pack fits snuggly into the box and I love that it covers the entire box so I can feel comfortable that all the food in the lunch box stays cold. 3) I even love this ice pack so much I often use it when we are on the go in my cooler or in different lunch boxes if needed. A really good feature of this lunch box! At the end of the day the yubo comes completely apart and you can simply put it in the dishwasher! I wipe the faceplates down with a wet cloth and remove them before I put the rest of the pieces in the dishwasher. I really love this about the yubo! 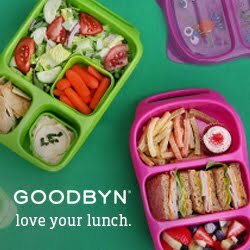 No more dirty lunch bags, scrubbing yogurt, applesauce or ranch dip out of all the lunch bag folds. Put it in the dishwasher and let it do the job! There is no room for a drink in the yubo so you either need to buy their drink holder which attaches to the yubo or send in a drink separately - not a big deal in my book since the drink holder is only $5.95 and enables you to send in a reusable water bottle instead or disposable juice containers which I prefer. It is slightly bigger them a regular lunch box especially with the drink holder attached but my kids love carrying it to school and we never had any issues fitting it into their backpacks and lockers. Open to U.S. Residents only. Please do not enter if you have received free products from yubo in the last 3 month. Make sure to leave your email address! I will email the winner on Friday. You have 48 hours to respond or I will have to re-draw a winner. No exceptions! Also, make sure to check back! I will post a coupon code so all of you who did not win can still get a yubo with a discount! This snowman lunch is adorable! The Yubo looks fun! This could not have come at a better time! I was just thinking that the kids lunch boxes were looking a bit "tired" and could use some work! oh - and would likely prefer a blue one - for the kids to share initially - if it's really as great as described, I'm sure I'll be getting another one! I would love the school rules yubo for my two kids to share. Love your blog. Gorgeous lunch! Love your pictures and review! I love all the colors but I think I'd love to win the pink yubo! Such a cute lunch. Love that the entire box is dishwasher safe! Robots! My son would be giddy to carry the robot Yubo box - it's adorable! Robots! My son would be giddy to carry the Robot Yubo! Pink Lunchbox with Love Birds is adorable! I would pick the Butterfly Faceplate Set - Personalized! I am giving away a non-personalized yubo but those personalized ones are so cute, aren't they? Good luck! I would love the Orange Personalized Lunchbox with the Under Construction Faceplate! It's adorable! My son would love it! Green with Sunny Garden. And I love that if you just want to order more faceplates as your kids' tastes change, shipping is free! where do I comment on which lunch box I would like to win? I went to yubo.com but not sure where to go from there? Heather, just comment here letting me know which non-personalized lunch box you liked best! Your snowman is utterly adorable, and I love the stacked cheese stars! The pirate blue box would be the most used and loved here. My little guy loves pirates! Thank you, Jenn! Good luck! Tammy, I am giving away a non-personalized lunch box as noted in the Rafflecopter widget but I bet she would love either of those lunch boxes - they are so cute! Good Luck! I would love the blue one!!! I just saw these for the first time last week and am planning to buy a few! I love that all the parts are dishwasher safe! This would be perfect for when my son starts Kindergarten this year. I would love to win the blue lunchbox with Fire Truck Dog. I would love the robot one!! I would love the blue pirate one! Love your blog! These are awesome! I'd love to win the Pink Lunchbox with Love Birds one. I love how it all comes apart--very nice feature! I like the dinosaur one the best. :D My little sister would love it! I think I would pick the Firetruck box. Jacob would love the blue firetruck box! My daughter would go crazy for the pink fairy princess one! 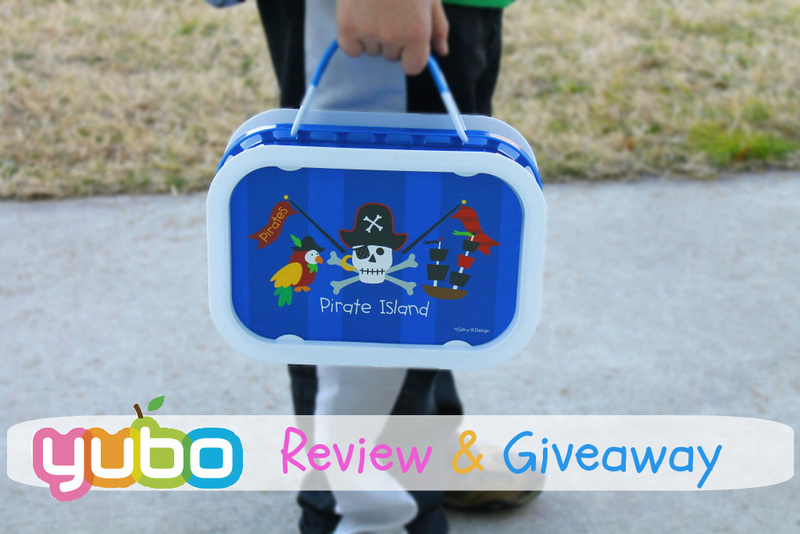 Thanx for the review, there's so many lunch containers out there, I don't know which to chose! Thank yo for your review there are so many different styles out there! We love the cupcake box! I would love to get a personalized/ custome one so I can detail Little Miss' food allergies RIGHT on the lunch box!!! My girl would love the pink fairy princess box. My little one would love the pink one with the fairy princess faceplates. It is a tough choice, but I'd pick PIRATE! I'd like to win the Green Lunchbox with Peace Faceplate Set. Thanks for the giveaway! I would love to have a second Yubo so each girl could have one! Finally a YUBO Giveaway!! I would love to win one for my little girl. I'd probably pick the pink princess or fairy or ponies. Thanks for the lovely giveaway, NINA!! Love the ingenious idea of using popcorn, it looks so much like snow! Thanks for coming by my bentoblog! You have lovely bento creations here! Breakfast for Lunch and a Winner!